La benamata Reel Recordings di Michael King pubblica in una tiratura limitata a cinquecento esemplari The Poppy Seed Affair, film del 1981 diretto - per modo di dire - da Robin Thornburn, con protagonisti The Matchbox Purveyors, cioè Ian Hinchcliffe, Jeff Nuttall, Mark Long, Gerald Fraser Fitz-Gerald, Lol Coxhill e Foxy. Le musiche sono del solo Coxhill, in qualche momento raggiunto da Robert Wyatt e Archie Leggett. 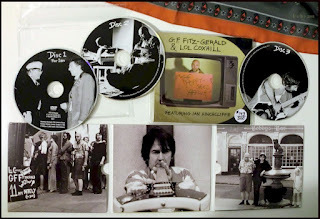 Oltre all'esilarante dvd nei due cd audio ci sono una registrazione, sempre del 1981, di Fitz-Gerald e Coxhill in concerto, e un ampio capitolo dedicato a collage sonori e giochi su nastro realizzati dal solo Fitz-Gerald a metà anni settanta. Imperdibile! Electric guitar radical G.F. Fitz-Gerald and soprano saxophone subversive Lol Coxhill, dual masters of spontaneous art and intuitive music, unleash The Poppy Seed Affair, a three disc collection for your edification and confoundment. The Poppy Seed Affair film was produced in 1981 by London’s anarch-oholic troupe, The Matchbox Purveyors: Ian Hinchcliffe, Jeff Nuttall, Mark Long, G.F. Fitz-Gerald, Lol Coxhill & Foxy. Inimitable soundtrack by Lol Coxhill, sometimes in trio with drummer Robert Wyatt and bassist Archie Leggett. Now rescued from utter obscurity to dvd (NTSC all region), this comedic tour-de-farce juggles the insane, the inane with a twist of the profane. Complementing this complete experience are two extraordinary compact discs mastered directly from true-to-life tape recordings out of the G.F. Fitz-Gerald archive. Compact Disc One is an intimate, close-mic concert recording of Fitz-Gerald & Coxhill at Newcastle’s Spectro Arts Workshop, 1981. Here the duo’s mercurial genius for spatial sonics is fully displayed. Compact Disc Two collects several works for tape, beginning with Listen Collage, which reconstructs, à la Faust Tapes, random room sounds of bizarre hippie domesticity, bedroom radios, tape recorders and ambient street sounds from London’s Ladbrooke Grove during the spring of 1969. Unmistakably this is a prodigious twenty minute audio adventure unique to its epoch. Following Listen Collage are two extended works for and prepared guitars and sundry effects, leading to the sampled tape loop trip Band In My Head. And lastly, a tape collage for The Matchbox Purveyors’ stage show, The Team. This entire disc transforms the magic of the creative moment into deeply experiential realms for our minds eye. Furthermore, in refusing to impose any impure digital processing whatsoever, these analogue recordings remain en vérité. Few guitarists have so audaciously scaled the sonic heights G.F. Fitz-Gerald has, no other saxophonist sounds as Lol Coxhill does, and Reel Recordings proudly presents a profusion of their unadulterated artistry throughout this rare archival collection. The Poppy Seed Affair is delivered in a numbered limited edition of 500 copies. Warning: may induce hilarity and confused thinking!